Are art and science separated by an unbridgeable divide? Can they find common ground? In this new book, neuroscientist Eric R. Kandel, whose remarkable scientific career and deep interest in art give him a unique perspective, demonstrates how science can inform the way we experience a work of art and seek to understand its meaning. Kandel illustrates how reductionism--the distillation of larger scientific or aesthetic concepts into smaller, more tractable components--has been used by scientists and artists alike to pursue their respective truths. He draws on his Nobel Prize-winning work revealing the neurobiological underpinnings of learning and memory in sea slugs to shed light on the complex workings of the mental processes of higher animals. 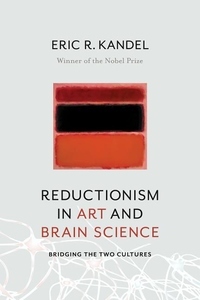 In Reductionism in Art and Brain Science, Kandel shows how this radically reductionist approach, applied to the most complex puzzle of our time--the brain--has been employed by modern artists who distill their subjective world into color, form, and light. Kandel demonstrates through bottom-up sensory and top-down cognitive functions how science can explore the complexities of human perception and help us to perceive, appreciate, and understand great works of art. At the heart of the book is an elegant elucidation of the contribution of reductionism to the evolution of modern art and its role in a monumental shift in artistic perspective. Reductionism steered the transition from figurative art to the first explorations of abstract art reflected in the works of Turner, Monet, Kandinsky, Schoenberg, and Mondrian. Kandel explains how, in the postwar era, Pollock, de Kooning, Rothko, Louis, Turrell, and Flavin used a reductionist approach to arrive at their abstract expressionism and how Katz, Warhol, Close, and Sandback built upon the advances of the New York School to reimagine figurative and minimal art. Featuring captivating drawings of the brain alongside full-color reproductions of modern art masterpieces, this book draws out the common concerns of science and art and how they illuminate each other.